Another thread on the site was devoted to "Pictures, then and now" (https://www.uglyhedgehog.com/t-572854-1.html) and I thought a lot about the OP's thoughts about the changing technology being paralleled by changing lifestyles and changing preferences, how there seems to be an element of personal connection lost with not touching the images physically as you share them. I read a good many posts, but not all, so if this post begins to overlap, I apologize. I just immediately thought of vinyl records. I was born in 1969, right at the end of the days when the phonograph and vinyl reigned unchallenged. By the mid 1980's I had collected quite a stash of vinyl, the money earned mowing laws, clipping hedges, or washing cars. I always enjoyed the process of sweeping the vinyl, handling it only at the edges, and replacing an old stylus. And the music was so much more robust and clean than we could hear on radio. What i did not know was the unimaginable emotional mark on my life that was being made with the "work - buy - play - clean and play again" rituals of vinyl. As I began to drive, of course I began to employ the cassette tape to make my music portable, even though I hated the always audible hissssssss created by the amplification of unwanted signal noise. I never could enjoy Pink Floyd on cassette.... the noise was just SO overwhelming in soft passages..... but I digress. Then came CD's (huge improvement) computer files and data CD's... Fast forward to today and I have about 2500 songs on a couple of thumb drives in my car. Just for fun I loaded them all to a single playlist on my computer and it was something like 157 hours of music. That would be unimaginable to my youthful self, flipping from record number one to record number 2 on the Beatles' White album. 2500 songs and 150 hours of music on a pair of plastic things that fit easily in your pocket???? Funny though, a few months after I lost my dad almost nine years back, I ran headlong into a meltdown one afternoon when we went to move our entertainment center like 7 inches to the right to make room for a new shelf to hold our increasing DVD stash. 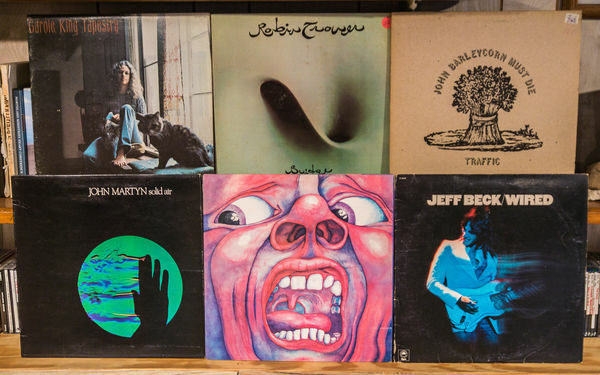 I had to remove about 75 pounds of old, forgotten, almost hoarder-worthy, vinyl, and as I did, I was steamrolled with VIVID memories of which job I had completed for a neighbor or friend of the family to have the cash I used to buy it. I remembered my dad taking me to the store TO buy it. I remember the time he knew I was saving for a particular collectible colored vinyl, and bought the only copy at the store and gave it to me a few weeks later on HIS birthday. I remembered him pretending to be half as excited as I was with whichever record I had just gotten..... I remembered how lucky I had been in my youth to have him... and I cried for an hour. Barkeep? Another round please..... and a couple extra napkins? Think I have something in my eye. I was never very good at taking care of my vinyl collection. They always ended up scratched and worn out. I liked CDs better because they didn't have that problem, but my music listening really changed forever with my first iPod. I could carry my entire music collection around with me, hundreds of albums, or listen to it on my home or car stereo. I could much more easily search for what I wanted to hear, and I could make playlists of different genres of music. I could listen to exactly what I wanted, or use shuffle play on the entire iPod, or on a single artist or on a playlist. I listen to much more music with my iPod than I ever did with vinyl or CDs, and I love music more than ever. I DJ at a local radio station. We have two excellent professional turntables. I bring some of my old records and play them on the air. Still more fun than cds and some say they sound better. I remember, and still have my "Zerostat", "Diskwasher", and my "Nitty Gritty". Matter of fact, I still use them. I get much better sound than from either my CD or DVD. Newer is not always better . . . .
What wonderful memories you have, and written extraordinarily well. Thanks for sharing. I'm a hybrid in this discussion. When I'm home, vinyl is my go to. Better fidelity and it is a "commitment" to listening and enjoying the cover art (larger format). Grew up with vinyl and dabbled in 8-track and cassette for a bit before being swept up in the cd wave. Three years ago, my best friend from eighth grade gave me two new re-mastered 180 gram vinyl reissues from the sixties and seventies. "Cool," I said and told him I didn't have a turntable anymore. That's your problem," he said. Bought a new turntable and receiver that has a phono imput (aux will not work!) and haven't looked back. The first time I played an old familiar album for my wife, she wondered why it stopped after the fifth song. I told I had to turn it over. I still have all my music in my iTunes library and ipod for the car and travel. My turntable has the ability to digitize albums and then transfer then to iTunes. The best of both worlds. My hunch is that vinyl will continue for a long time and cds will start phasing out, as young people are more into downloading and streaming. Life without music would "b-flat." Back about 40 years ago I lived in Bloomington, IN. I knew this one house that held a yard sale each year. The man who lived there always had a box of perfect vinyl records. I asked him why they didn't even look played and he explained he owned a state of the art digital cassette. These machines were around for a few years before CDs took over but they were far superior to a regular cassette with a price to match. They sold for 1000.00 or more and that was 40 years ago. He would buy an album and play it just once as he recorded it on his digital tape. He would then put the record back in the sleeve and sell it the following spring. I always liked the vinyl records over any other media because you can hear the small imperfections like an artist's fingers sliding over the strings -- something digital culls out as noise. I still have my first Album purchase. Bought it in Nashville, TN while living there. It is the Rascals Time Peace album, a collection of their greatest hits. Excellent post as it sure awakens memories for myself and others who have lived through all the days of vinyl, 8-Track, cassette, and beyond! Now it is possible to take a mini SD card the size of your little finger nail with 128 gb and load thousands of songs on it! What a world we live in! Great post so wonderful how the vinyl brought back those memories. Songs become a part of our memories and remind us of our special times here on earth. Would be interested to know what program you used to convert vinyl to digital. I've tried without success. Though I have only done digital conversions on a select fraction of my vinyl collection, the program I used was a free one called 'Audacity' and by using either a cheap-ish modern turntable and USB input or the same program and short gold plated 'aux' cord coming from the headphone jack of my 1980's vintage turntable / amp combo. 'Audacity' allows one to apply fade-in Fade-out, noise removal, tone shift, click and pop removal and a plethora of other digital sound file manipulations, again, on a free platform that is not too hard to teach yourself. My new machine simply produces an inferior signal due to its heavy stylus, but without amplifying any motor or EM 'hum', while the old system creates a better initial signal but a detectable amount of high-end hiss. I prefer the new system for stuff like the 45 or so vinyls from Time/Life's Swing Music box set I converted for my wife, as most of those recordings were of average fidelity anyway, so the time saved trying to filter out 'hum' or 'hiss' was worth a little loss of fidelity. I did digitally convert a brand new, modern press, Dark Side of the Moon with my old phono/amp just to see how the vinyl compared to a digital copy and found that after eliminating the hiss, the only noticeable flaw was the speed of my turntable was a tiny fraction slow vs the digital files I had from CD. Some of the best vinyl in my collections are direct to disk. Dave Brubeck, etc. I was born in 1940. At about age 8 my grandmother gave me some 78 RPM records, some of which I still have, and a player. I later got one that played 33 RPM, and still have a good record player. I must have several hundred 33 RPM records, and enjoy them still. As you say, they bring back memories of a world that has changed so much. Yes, I have cassettes, and CDs, but I'm glad I kept my old vinyls. And for me, music gives life more meaning. I love classical; to each his own. And, I certainly like your writing style. Thank you for a lovely post. Ed G.